In 1968, ten thousand students marched in protest over the terrible conditions prevalent in the high schools of East Los Angeles, the largest Mexican community in the United States. Chanting “Chicano Power,” the young insurgents not only demanded change but heralded a new racial politics. 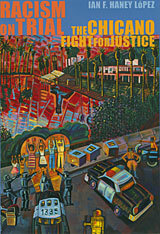 Frustrated with the previous generation’s efforts to win equal treatment by portraying themselves as racially white, the Chicano protesters demanded justice as proud members of a brown race. The legacy of this fundamental shift continues to this day. Ian Haney López tells the compelling story of the Chicano movement in Los Angeles by following two criminal trials, including one arising from the student walkouts. He demonstrates how racial prejudice led to police brutality and judicial discrimination that in turn spurred Chicano militancy. He also shows that legal violence helped to convince Chicano activists that they were nonwhite, thereby encouraging their use of racial ideas to redefine their aspirations, culture, and selves. In a groundbreaking advance that further connects legal racism and racial politics, Haney López describes how race functions as “common sense,” a set of ideas that we take for granted in our daily lives. This racial common sense, Haney López argues, largely explains why racism and racial affiliation persist today. By tracing the fluid position of Mexican Americans on the divide between white and nonwhite, describing the role of legal violence in producing racial identities, and detailing the commonsense nature of race, Haney López offers a much needed, potentially liberating way to rethink race in the United States.